The joint entrance exam is one of the most challenging exams conducted all over India, more than 10 lakh of students give this examination every year and this number is rising yearly leading to augment of competition among students. So for cracking such examination both hard and smart work is required as result self-study despite being a good way of preparation doesn’t remain enough to give such examination as more experienced guidance and advancement of knowledge is required to clear these papers. Nowadays, every other person has started teaching students about jee paper but sometimes due to lack of experience in this field as well as lack of teaching skills and staff, they may misguide the students resulting into wastage of money and time, that’why before joining any institute a student must make a complete study and background of that institute so that his crucial time will not go waste. Joining an institute is just like an icing on a cake i.e. it not only clears the doubts and concepts of the students but also make them aware of the current scenario and exam pattern of the exam, moreover, it also creates discipline among students and works like a timetable for them to study in a sincere manner. In this post, we are providing you with the necessary details about the various coaching centres and institute that are best for clearing this examination with flying colours but you must keep in mind not only coachings but your self-study is also important to get the desired result. 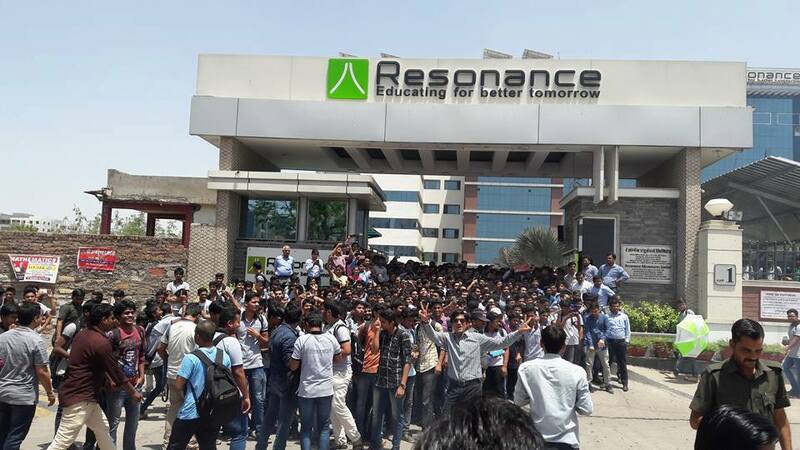 It is one of leading institute situated in Kota Rajasthan established by Ram Kishan Verma(IIT Chennai Graduate) on 11th April,2001.it has received so many overwhelming responses from the students you can also check this by going to their site from this you will get more clear about this place and institute. If you are from NCR region then you must take admission here as why not take best available options that will be nearer you instead of settling yourself in other city dealing with more expenses of living along with the fee of the institute.This institute enjoys a good reputation with an excellent result everywhere if you are not believing then just have a glance at their site or just take demo classes theirs. I guess words will become less to express this unique way of teaching here with a limited batch of 30 students.This innovative idea of teaching involves searching and finding those students who possess the talent of logical thinking and intelligence but lags behind due to social backwardness.this institute runs under the banner of “Ramanujan school of mathematics”.it has 100% result in which all 30 students had cleared the examination. This institute is also one of the reputed institutes that along with providing teaching assistance also provides online tests for students for both jee mains and advanced.its main branch or headquarter is in Kota, Rajasthan. This institute is also one of the leading institutes in Delhi NCR.students all over India come to Delhi to join this as it not only provides good teaching stuff but good hostel facility as well. It is also one of the best coaching centres for the students who aspire to become an engineer.they make these aspirants get ready to fly even before the beginning of their crucial years of study as they start to coach students from the 6th class up to 13th thus making them confident and fearless to give examinations. These are best known for producing the best results in this field comprising interactive and technology-aided classes, they not only pay personal attention to every student but also makes them well prepared before examination.go to their site for getting more information about fee structure and for any other details. One of the respectable names of the institute in this field having an experience of more than 25 years established in Kota, rajasthan.they began their career in premedical coaching but now has expanded their coaching centres in more than 5 other places like Jaipur, Ahmedabad etc. The pace is also one of the best and emerging instituted guiding and igniting the minds of the students.with their sincere dedication, devotion, and hard work have excelled field of teaching and guiding students.you can trust them with your money and time. 10. Sir Chaitanya and Narayana (CHAINA), Hyderabad. Sir Chaitanya and Narayana were two different institutes who were rivals initially but they have collectively established a new coaching centre called CHAINA by collaborating together, they were in top 3 ranks in jee mains 2016. The information provided about these institutes as stated above are all best institutes, apart from studies, none of one should be compared with the other in terms of teaching as they all are working towards the main objective of increasing the standard and qualitative study techniques and procedures. However, for finding best among them for you, you need to make a list of pros and cons of each institute in terms of locality, fee structure and infrastructure and crowd, conveyance, in this way, by comparing each of these with one other you will be able to find the institute that will be best for you to begin your studies. But also always keep in mind these institutes only guide you towards your goal but all the hard and smart work will be done by you and you only, nothing can be substituted with it and I recommend you to at least once go through all these sites before choosing the best coaching for you.